The members of the SCCC women’s outdoor track and field team were presented awards by Coach Bob Harris, right, at last Tuesday night’s banquet. 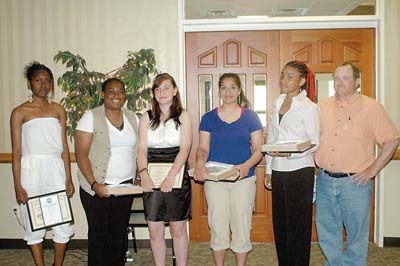 The team members are, from the left, Nyoki Tate, Danielle Darby, Alyssa Corbett, Tehnyat Khan and Erin Lane. Missing from photo is team member Marisela Acevedo. LOCH SHELDRAKE  Dozens of student-athletes were honored last Tuesday evening when Sullivan County Community College held its annual Athletic Banquet in the Paul Grossinger Dining Room. “Once again, this has been a great year for Sullivan athletics,” said SCCC Athletic Director Chris DePew as he welcomed everyone to the event. DePew noted the accomplishments of all of the school’s sports teams: Men’s Cross Country, Women’s Cross Country, Men’s Golf, Men’s Basketball, Women’s Basketball, Men’s Outdoor Track and Field, Women’s Outdoor Track and Field and Baseball. “I’m very proud to lead this department,” said DePew, who added that he is completing his 10th year as the Director of Athletics at SCCC. DePew thanked the SCCC Administration, all of the coaches and assistant coaches for the teams, Rob Barrese, who is the SCCC Strength and Conditioning Coach, Athletic Department Secretary Georgia Lyons, Rhea DeMaria, Jennifer Bonelli and the SCCC Buildings and Grounds Department. SCCC President Dr. Mamie Howard Golladay, Vice President of Academic Affairs Dr. Robert Schultz and SCCC Board Chair Phyllis Coombe all offered their congratulations to the Generals and Lady Generals. “Your coaches and athletic director have been very good role models for you,” Golladay said. “I extend congratulations to all of you for your accomplishments on the playing fields, courts and in the classroom,” Coombe said. Each of the coaches then thanked the members of their respective teams and recognized three team members with special awards. The final award presented was the 2010-2011 SCCC Athlete of the Year. The three finalists were: Tehnyat Khan, nominated by Women’s Track and Field Coach Bob Harris, Crystal Salgado, nominated by Cheerleading Coach Janna Comando, and Cleanthony Early, nominated by Men’s Basketball Coach Kevin DeVantier. Early was chosen as the SCCC Athlete of the Year.